When I first saw this recipe in the Australian GoodFood magazine, I knew immediately that this is "Crazy cake"! Crazy! ?? 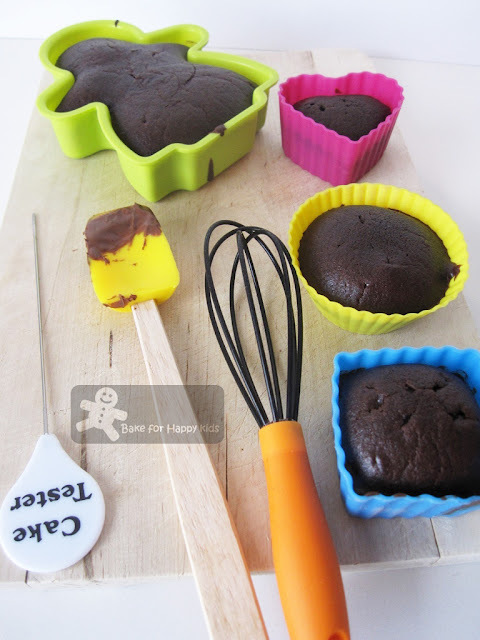 ?...Accordingly to Nestle website, Crazy cake is a very moist chocolate cake recipe developed in the 1940’s. This cake is called "Crazy" because this super-easy-to-make cake contains no eggs, butter or milk and it is amazingly very moist and chocolate-y. I have bookmarked this recipe immediately as I was browsing this magazine, thinking that it will be fun and easy baking this cake with my 2 yrs old boy. We are a great team baking these cakes. I weighed the ingredients and all he did was mixing all together...easy peasy. I'm always biased thinking that dairy-free cakes are always not as tasty as the conventional cakes that contain dairy products. I was fussy with these cakes and insisted of eating these cakes with extra melted milk chocolate. To my surprise, my usual little fussy cake-critic was easy-going with his taste bud this time. My son simply loves these cakes knowing that he had played a "major" role in baking these cakes and he was happily chomping off these with heaps of enjoyment. We both have a great time baking these cakes. Preheat oven to 160°C or 140°C fan forced. Grease and line base of a 20cm springform pan. Sift together flour, bicarbonate of soda (baking powder), cocoa and a pinch of salt into a large bowl. Stir in caster sugar. Whisk oil, vanilla, vinegar and 1 cup of water in a jug. Pour into dry ingredients and mix until combined. Pour into prepared pan. Bake for 30 min, until a skewer inserted into center comes out clean. Cool in pan for 15 min, then transfer to a wire rack to cool completely. 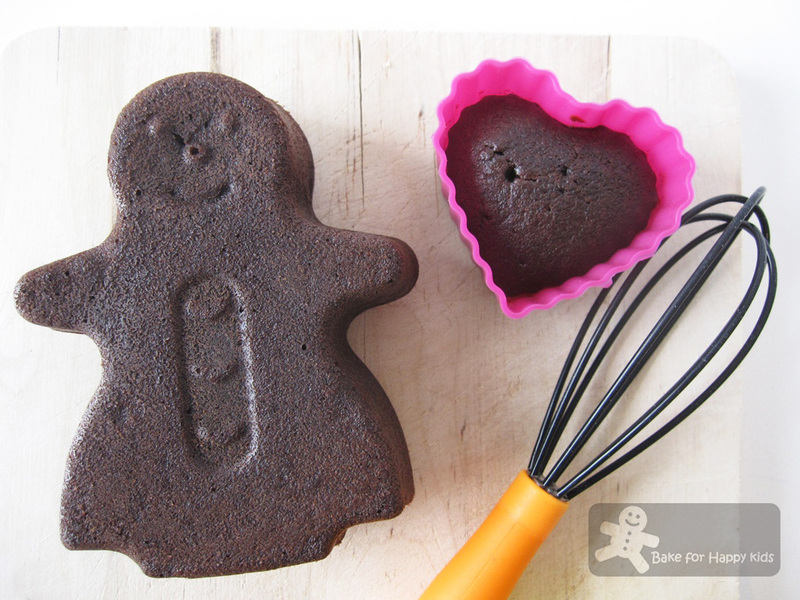 Note: We use half of this recipe to bake one medium-size "girl" cake and three smalls cakes using silicon cake moulds. The cakes are baked at 160°C fan forced for 15 min (small ones) and 20-25 min (medium size one). How interesting. I've never heard of rice bran oil though? What is that and is it readily available? Wow, these cases are so beautiful! I love your cake tester! Cool, and no eggs and no dairy products... I'll give you a +1! I'm not surprised your son loved these!! So cute...and they look perfectly dense and chocolaty! YUM. The kids must love baking rite? They look so moist, almost fudgy-like. Crazy cake!? What an interesting name. I have a similar recipe saved to try as well. Mine is called wacky cake and I'm betting the ingredients are a close match. So much fun! I no longer have toddlers but I think they would like these anyway! 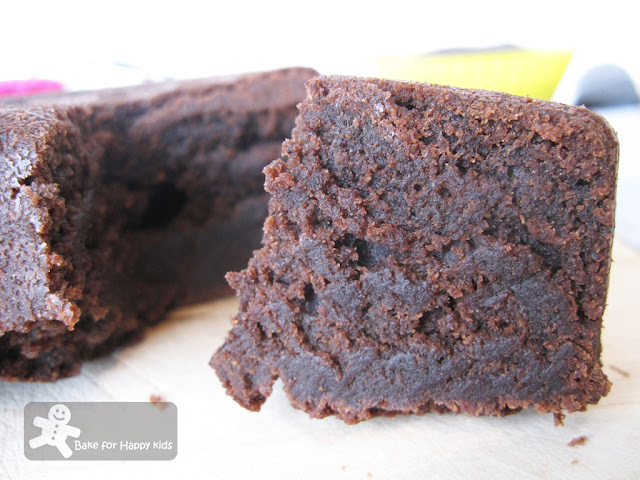 yes, i think we shldnt understimate the simplicity of a recipe, it looks great and fudgy too! Hi Zoe, my comment did not get thru y'day! Very cool! I have baked with my now-almost-4 year old-son for years, and this one would be a great one to add to our reportoire! I love that licking the beaters is safe with this recipe!! Awwww, glad you had a great time with your little one! These cakes look very yummy!! Lian: Rice bran oil is the kind of oil extracted from the germ and inner husk of rice. Being low in saturated fat and yet has a slightly buttery nutty taste, it is a great replacement for melted butter for a healthier version of cake. If rice bran oil is easily not available, you can replace it with any neutral tasting vegetable oil for this recipe. Cheers. Thanks for visiting my blog, glad you liked it. Come back again often! I love this little baking cups, my grandkids would love helping me bake with these. The recipe looks yummy too.